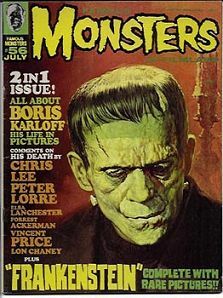 July 1969 issue of FM featuring a memorial to Boris Karloff, who had died earlier in 1969. Many rare photos featured and comments from Karloff's many notable fans. Near-mint condition. Unlike Bela Lugosi, Karloff lived to see the revival of the monster craze in the early 1960's. He gained many new fans in these years, thanks to Famous Monsters magazine and it's many competitors. Karloff acted in films right up to his death at the age of 81. He was a real trooper. Website design and hosting by Sohodojo Business Services. Item 154 of 466 items displayed in viewer. 0 items in cart.